The global expansion of the observed Universe is accelerated by cosmic antigravity—this has been found [1,2] with high-redshift type Ia supernova observations at the very large distances of more than 1000 Mpc, half-way to the observation horizon. Antigravity is produced by enigmatic dark energy which contributes about 3/4 to the total energy of the Universe [1, 2]; this figure is also confirmed by cosmic microwave background (CMB) anisotropy studies [3, 4]. Does antigravity act on relatively small scales as well as on global ones? High-accuracy observations of the local expansion flow made with the Hubble Space Telescope enable us to discover antigravity and to estimate dark energy density in the Local Universe at distances of a few Mpc from us. The result is entirely independent of large-distance observations or CMB studies; however, it is compatible with and complementary to them. 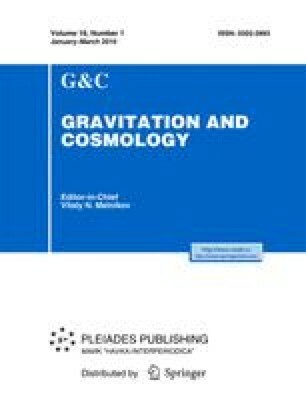 Together with the results of [1–4], this forms direct observational evidence for antigravity as a universal cosmic phenomenon existing on small and large scales. Antigravity and dark energy are little understood, and elucidating their physical nature provides perhaps the biggest challenge in physical cosmology.